It's that time of year - the hustle and bustle of the holiday season is in full swing and we are loving every minute of it. It's about this time in the holiday season that I start thinking about teacher gifts. What can we make that the kids can help with? What will teachers appreciate? 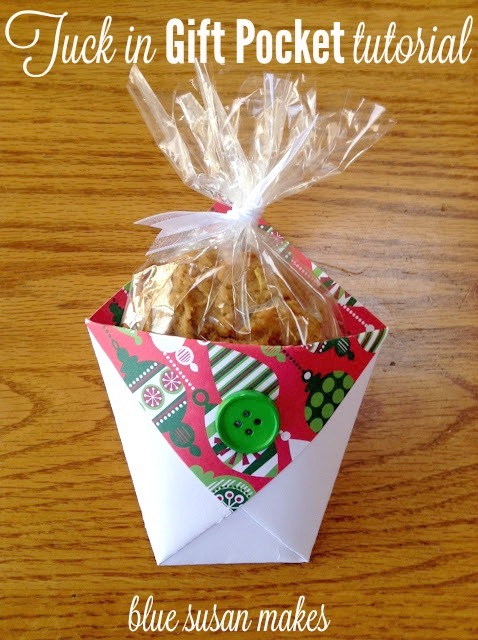 This year I have decided on a simple gift that the kids can do almost independently: Tuck-in gift pockets filled with cookies. All you need is some square card stock, coordinating buttons or ribbon, a glue stick, a hot glue gun, a ruler, and a pen. For this pocket I used an 8x8 piece of Christmas card stock that I bought in a pack from Hobby Lobby. I like using matte finish card stock - glittery, glossy, and foiled paper tends to tear on the edge when you fold it. If you don't have square card stock on hand, you can always cut down 8.5x11 paper to be an 8.5 inch square. Your finished pocket, made with 8x8 inch paper measures 5 1/2 inches tall by 4 3/4 inches wide. Take your piece of paper, colored side up, and fold in half to make a triangle. Mark a dot, 3 1/4 inches down from either side of the point. Match the right folded point to the dot on the left side of the right angle point as shown in picture 3. The tip of the point should not come to the edge of the paper - it should be about 1/8 on an inch away from the edge. 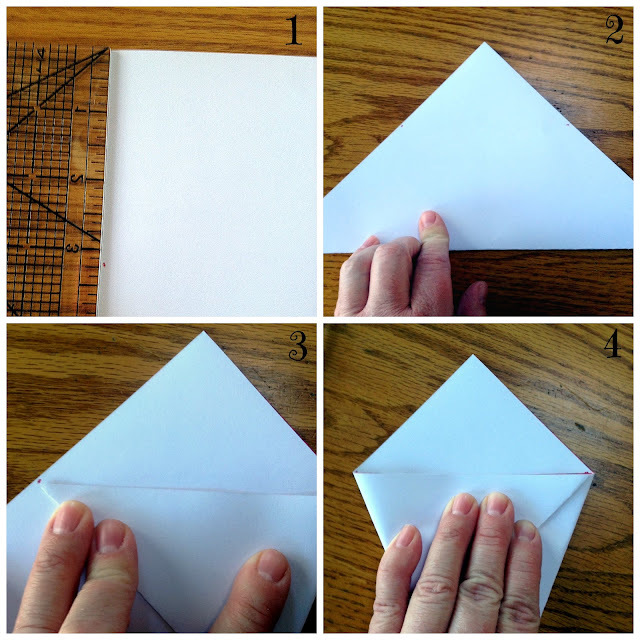 Crease the fold. Repeat for the opposite side as shown in picture 4. Pull the flap down and crease the edge. Using your glue stick, secure the flap to hold it all in place. Embellish with a button or bow - you may need to use a hot glue gun for this step. Have your kids help you whip up a batch of their favorite cookies. I used this Chewy Ginger Cookies with Sweet Orange Glaze recipe from sugardishme.com. It's delicious. Mine turned out a little flat at first, so I added an extra cup of self rising flour and they turned out great! This medium size pocket will hold two 3 inch cookies. I put them in a cellophane bag with a little ribbon to tie it off. Have your kids write a little note on the back for their teacher. These pockets are so fun - the possibilities are endless. 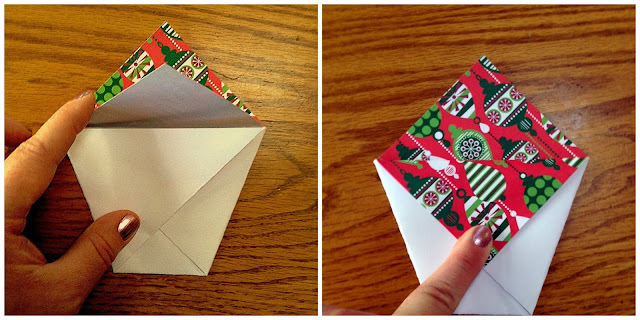 You can use double sided card stock in all sorts of sizes. 12 inch paper makes a large pocket that is 8 1/2 inches tall by 7 inches wide - it makes a big pocket that fits extra large cookies, or a mini loaf of bread, or a scarf, etc. 6 inch paper makes a 4 1/4 inch tall by 3 1/2 inch wide pocket. It's a cute little pocket - perfect for holding a gift card or some cash. Don't have time to make them? You can by an assorted 3 pack in my Etsy shop. There are lots of different ones for sale, so take a look! Wow! Such a cute little container! Thank you for sharing this great tutorial. It's on my to do list.